We must educate ourselves to understand the behemoth we face and how to do battle. More importantly to know its foundation so it can be up-rooted and planted with the good seed of truth. For our battle is not of flesh and blood but principalities and powers. 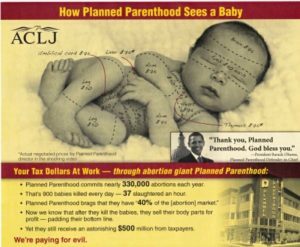 WARNING: This detailed description about abortion is very graphic, no visuals but the description is horrific to imagine this is being done to infants, in what should be their most protected place, ‘their womb’. Dr. Levatino OB/GYN testimony on the barbarism of abortion before Congress on C-span. LINK to Part 2 because youtube will not allow Part 2 to be watched on my site and its just a matter of time before they’ll remove from youtube completely if it gets too much traffic. LINK to view this video at TruNews.com in the event youtube takes it down completely. This is a shocking eye-opener and one that everyone seeking to protect children need to understand. Allowing abortion has led to an explosion in un-abetted evil to flourish in several communities that many people trusted and will find this difficult to believe. However, having said that evil presents itself as a ‘sheep’ in wolves clothing, and evil is in all religions, races, cultures, communities, and countries. Our SCOTUS needs purging. Listen to this… rarely is the CONSTITUTION debated but instead they debate BLACK’s LAW and other cases. Our CONSTITUTION is above Black’s Law; all law needs to be legislated on its constitutionality in accordance with the Constitution as it is WRITTEN – Ruth Bader Ginsberg references the UN CHARTER et al. Democracy does not determine our law because our Constitution binds the power of ‘mob rule’ democracy to protect the rights of ALL people including infants still in their womb. Our founders despised democracy and gave us a Republic, not a party system but a system of protection from a loud, aggressive mob!